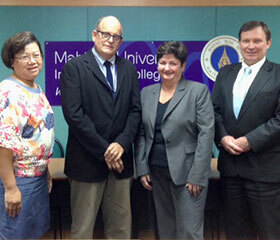 St. George’s University has joined with Mahidol University International College (MUIC) in Salaya, Thailand, to offer students an opportunity to obtain a dual BS/MD degree. Through the partnership, qualified students will be able to pursue a career in medicine at St. George’s University (SGU) following successful completion of three years of premedicine at Mahidol University. Applicants interested in the dual degree program must meet all admission requirements of Mahidol University (MUIC) and St. George’s University School of Medicine program. Once admitted to the dual degree program, and after successfully completing three years of undergraduate study at MUIC, qualified students will proceed to the first year of the medical program at St. George’s University. Upon successful completion of the first year of the MD program at SGU, qualified students will have fulfilled the requirements for a Bachelor of Science degree from MUIC and will be eligible to complete the remaining three years of study at SGU leading to the MD degree. In addition to the partnership with Mahidol University, St. George’s maintains partnerships in the United States and United Kingdom with the New Jersey Institute of Technology (NJIT)/Albert Dorman Honors College, St. Michael’s Medical Center, Caldwell College, Franklin Pierce University, St. Thomas University, University of the Sciences, Monmouth University, Widener University, Northumbria University, Abbey DLD Group of Colleges, and University of the West of England. The University has similar partnerships with schools in Canada, Bermuda, Grenada, Guyana, Hong Kong, and Uganda. 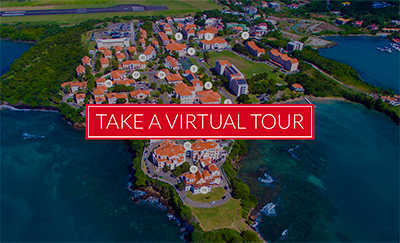 St. George’s University is a center of international education, drawing students and faculty from 140 countries to the island of Grenada, in the West Indies, to its programs in medicine, veterinary medicine, public health, science, and business. St. George’s is affiliated with educational institutions worldwide, including the United States, the United Kingdom, Canada, Australia, and Ireland. The University’s over 14,000 graduates include physicians, veterinarians, scientists, and public health and business professionals across the world. The University programs are accredited and approved by many governing authorities and repeatedly recognized as the best in the region. Initially established in 1986 as the International Students Degree Program (ISDP), Mahidol University International College (MUIC) was Thailand’s first international bachelor’s degree program at a public university with its mission to produce well-rounded graduates and to excel in broad international education research and academic services for the benefit of humankind. MUIC maintains a strong liberal arts focus and promotes a learning culture that prepares its students to meet the challenges of living and working in a diverse and globalized world.